Do Your Students Know About Statistics—Today’s Hottest Career? The field of statistics has been around for centuries, yet its significance to society and the economy is possibly greater today than it’s ever been. Advances in computing technology have increased the value of data, guiding critical decisions and directing new areas of inquiry in business, science, policy, government and so many other areas of society. 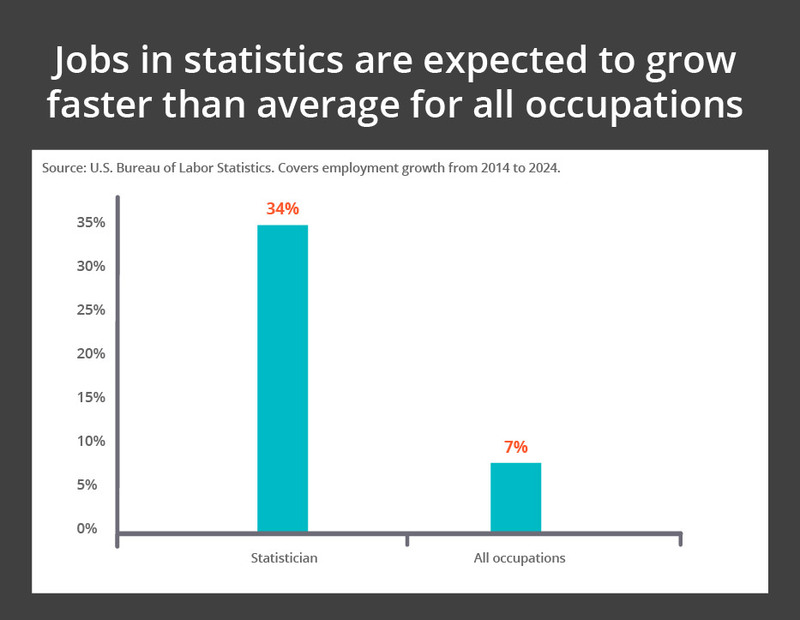 Statisticians have become so important to so many fields that demand for their skills is leading to strong job growth. A report by McKinsey Global Institute predicts the U.S. will need up to 190,000 new professionals with analytical skills to help manage the Big Data movement and run data analytics and business intelligence operations in the private and public sectors. 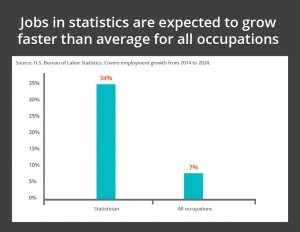 Additionally, the U.S. Bureau of Labor Statistics predicts that jobs for statisticians will grow 34 percent between 2016 and 2024, much faster than the growth rate of 7 percent for all occupations. This demand is also reflected in the pay of statisticians. The median salary for data scientists was $80,000 for those with less than three years of experience, and $150,000 for those with nine or more years of experience, according to a Burtch Works 2014 report. So it’s no surprise the nation’s top students are gravitating toward the field. The number of students taking the AP statistics exam doubled to more than 200,000 between 2006 and 2016. Last year, statistics was the fastest-growing degree on college campuses. Further, a large majority of college majors require statistics. Fact sheet about careers in statistics. This can be downloaded, printed, and shared in the career services office or distributed to classrooms. YouTube videos of statisticians who love their jobs and are changing the world through statistics. One of our most popular videos, “Why Study Statistics,” provides a great overview of what statisticians do. PowerPoint presentation counselors can use for Career Days and related events to educate students about careers in statistics. List of college majors with statistics. Statistics sets a foundation that students will put to use in a wide variety of college majors. Cool jobs in statistics. This webpage features 20 jobs in statistics that are exciting, interesting and representative of the wide variety of opportunities in the field. Newsletter about careers in statistics. This quarterly newsletter features interviews with up-and-coming statisticians, articles about job growth in the field, and how to plan for a career as a statistician. Sign up for the newsletter here. What Education is Needed to Become a Statistician? Many statisticians, data scientists or data analysts have at least a bachelor’s degree in statistics. Many also have graduate degrees or combine their statistics degree with a degree in another field. Expertise in computer science or programming also is important. The specific degree and level of education of a statistician or data scientist can vary widely depending on the individual, the sector and the job. Want to learn more about the different educational paths of statisticians? Read these career profiles of statisticians.